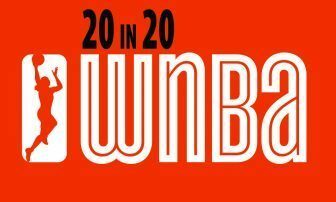 For 20 weeks, to commemorate the WNBA’s 20th season (the MSR having covered each season), the MSR sports section has featured a column or article on the W in our “20 in 20” series. The series concludes with this week’s finale. This wasn’t the first multi-part series we have undertaken here at the MSR, but our 20 in 20 series was ambitious in so many ways. Originally planned to run 20 straight weeks over the course of the season, overall we ended up publishing nearly 50 WNBA-related stories, columns, features, etc. in both this column, “Sports Odds and Ends,” and in MSR News Online exclusives each week since mid-May. If that same number were multiplied by seven (as in daily rather than weekly) and one of our two local daily newspapers had undertaken a similar series, it would have totaled around 350 installments. “Thank you very much,” said League President Lisa Borders of our efforts. 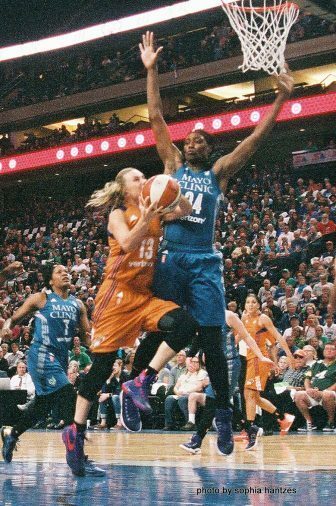 We began with Brandy Reed, the Lynx’s promising but troubled player in their inaugural season. Each week thereafter our series included tributes to the W’s forerunner and once top competitor, the American Basketball League; pieces on daughters of NBA players, Tamika Catchings and Kaayla Chones, who work for the Timberwolves; a Lynx-specific quiz, and another one on the league history to test your knowledge and increase awareness; an interview with the league’s founding president Val Ackerman; and numerous recollections by present and former players on the league’s importance in its two decades of existence. Our series was intentional — we wanted to highlight the many accomplishments by Black women in the founding, success and longevity of the league, to fully shine light on this and counter the oft-repeated ‘”The league is too Black” remarks by some. Our series also was intended to support Borders’ mantra to show the W “as an entertaining sports event” worthy to be seen and enjoyed alike by serious and casual hoops fans. All to prove a simple point: The WNBA is worth this, and more. The WNBA 20 years ago became a welcome extension of the women’s sports coverage that I have provided for this publication for almost 30 years. I have covered the league and the local team for the entire existence of both. Some reporters have vainly talked about the W, giving the impression that they enjoy covering it, when actually they are just bandwagoners along for the ride so long as it’s smooth. But these folk both locally and nationally often couldn’t be found at Lynx games, acting instead as if they were hiding out in some witness protection program. This season I can proudly say I didn’t miss one single home game — regular season and playoffs — including last week’s deciding final game in the Minnesota-Los Angeles championship series. We double-dare any reporter in this town to match that. It’s my beat, which I proudly love and maintain, and not an occasional cameo appearance. Now looking back, as with any multi-part series there are some regrets. There were some stories I wanted to do, some people that I wanted to speak with either in person or by phone, but time, space, or just bad timing unfortunately came in the way. The 20th W season is now history, as well as our “20 in 20” series — the title was inspired by the ESPN’s “Nine for IX” 2013 documentary film series on the 40th anniversary of Title IX. But whether in print or online, in “View” or “Sports Odds and Ends,” our WNBA stories, columns, features, etc. will continue, even during the off-season, because women’s pro and college basketball deserves top-notch coverage just as much as their male counterparts. “It is a great product,” in the words of WNBA legend Tina Thompson. Our entire “20 in 20” series can be found here.